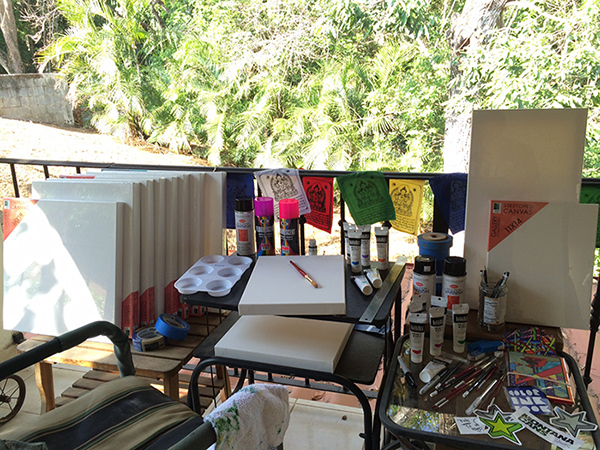 Jungle studio set up complete in Atenas, Alajuela, Costa Rica! The Jungle studio set up is now complete & I am ready to start creating again in the beautiful mountains of Central America! Over the next 2 weeks I’ll be painting a new body of 10-12 original works to be exhibited at Etnia in Atenas, Alajuela, Costa Rica. The opening will be on Friday, April 15, 2016 from 5-10pm and the exhibit will be on display until Sunday, May 15, 2016. Camilo Garavito is a great new friend and the owner of ETNIA. He will be featuring a “LIVE” band with local musicians along with appetizers and homemade sangria through the exhibit for all whom attend.